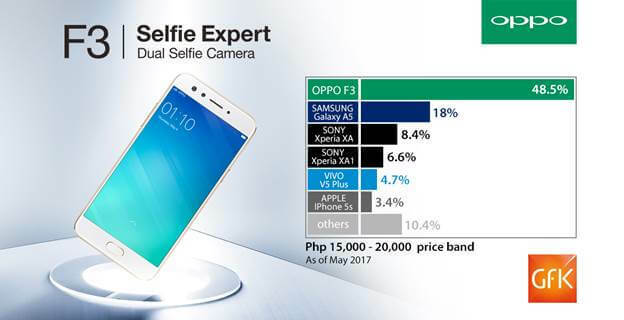 According to the May 2017 report of GFK Philippines, the latest smartphone offering of OPPO Philippines, the OPPO F3, dominates the local market in the Php15,000 to Php20,000 price segment. Looking at the table above, the OPPO F3 left its competitors in the dust by capturing 48.5% market share. Even the next handset in the chart, the Samsung Galaxy A5, is not even close enough with just 18%, that's about 30.5% spread between the two devices. All the remaining brands in the list did not even make it to 10%, while the combination of the other brands not listed garnered a total of 10.4%. In addition, OPPO also managed to maintain its position as the number 2 smartphone brand in the country. To give a quick recap, the OPPO F3 sports a 5.5-inch Full HD display with Corning Gorilla Glass 5 powered by an octa core processor coupled with 4GB of RAM and 64GB of internal storage. It boasts dual (16MP f/2.0 + 8MP f/2.4) front cameras for amazing selfies and groufies. Initially released in gold and rose gold, OPPO added the black edition just last month. It is priced at Php16,990, but the brand has ongoing back to school promo until July 31, wherein they slashed 1000 pesos on its SRP to make it more affordable at Php15,990. You can read our OPPO F3 Review; The Group Selfie Expert for more info.